$0.99 to $99.99 & FREE Shipping on orders over $59 $35. Traditional Czech Saaz hops are most commonly chosen for aromatic additions to Pilsners and Lagers, but also work well in Light Ales and Belgians. Though alpha acids are low, Czech Saaz is used for both bitterng and an aroma of pleasant earthy, herbal and floral notes. You can finish just about any Lager recipe with this versatile hop. Even though it has a low alpha-acid content you will find many traditional recipes using this hop for both bittering and for flavor/aroma additions. How can you brew a Czech lager without Saaz?! Using it in a Vienna lager. For a Belgian-style dark strong. The cheapest online I could find that delivered in one business day. Great price for classic Pilsner hops. Are these CZ Saaz hop pellets imported or domestic? Are they 2017 Harvest? BEST ANSWER: Thank you for your inquiry. Unfortunately, we can't give a general answer of the crop year for the hops since our inventory is constantly changing and we always do our best to provide the freshest hops possible. If you're ever concerned with the quality of the hops, we're happy to help you out. These hops are imported Czech Saaz. I have been using morebeer for years all ingredients have been fresh and packaged proper...remember all produce grains hops wheat ect.. are all harvested in the fall. Spicy, pungent aroma that works perfect in a pilsner, i used 6 oz in my 5 gal batch... could have used even more! This is by far my favorite hop!! Wanna have a great lager? Use czech saaz hops. Shipped in nice air tight packaging and when I weighed the hops the weight was correct. Great hops for a Czech style Pilsner. Great product! 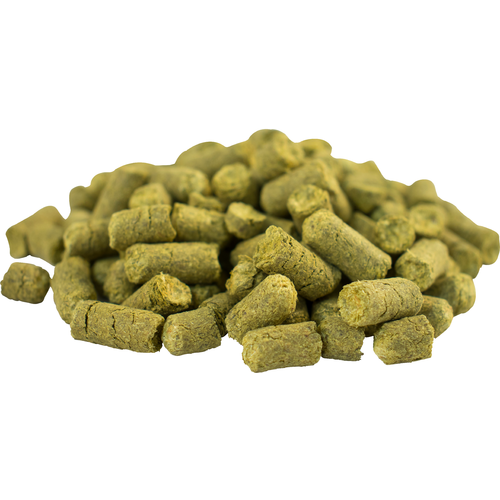 Brewing a traditional Czech Pils, Czech Saaz hop pellets are a perfect match. I made a Kolsch with these Saaz hops, and it turned out great. They added just the right amount of bitterness while allowing the flavor of the malt to come through. Used these hops in a Belgian pale & they did the job. Nice and spivey character.